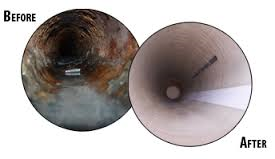 CIPP PIPE RE-LINING ~ We can re-line 4″ & 6″ Sanitary and Storm Sewer Laterals and Mains. Re-Lining can be used to restore normal drainage and flow when conditions allow. Re-Lining the pipe instead of excavating and replacing it can save you thousands of dollars in expensive landscaping, driveway and parking lot repairs. There are some circumstances that minimal excavating still may be the only alternative such as, a collapse in the sewer pipe, lack of pipe or to gain access into the sewer pipe to be able to reline it. Every job has it’s own demands and resolutions. Our “ROD & TOD” crew are the best in the business and will assure you “Piece of Mind” for the next 50 years. We soon will be offering re-lining of 8″ Sanitary and Storm Sewer pipe and long awaited 4″ to 6″ reinstatement services.